Winter explorers unite! The greatest powder stashes in the West have joined forces to create the Powder AllianceTM, twelve signature resorts who offer FREE SKIING benefits to anytime pass holders from other participating Powder Alliance areas. These twelve mountains include Crested Butte, Snowbasin Resort, Sierra-at-Tahoe, Stevens Pass, Timberline, Schweitzer, China Peak, Mountain High, Arizona Snowbowl, Mt Hood Skibowl, Angel Fire Resort, and Bridger Bowl. For the price of an anytime season pass to Mountain High, you receive three (3) FREE days at all other participating areas plus special offers on lodging, rentals, buddy tickets, and more. This offer applies to top-tier, anytime passes only and not midweek, spring, or other restricted options. Tickets are valid Sunday – Friday, non-holiday, and must be used during the 2013/14 season only. 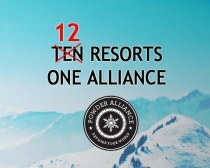 Guests are encouraged to visit www.powderalliance.com or their official resort’s website for a complete list of holiday dates and resort benefits. 33 FREE days at some of the best resorts in the West makes the Powder Alliance an incredible value when compared to the Mountain Collective and other expensive group passes. Plus it makes for a great winter road trip. As a Powder Alliance member, you are free to ski about the Western United States and find the best snow conditions & limitless vertical feet at resorts throughout California, Colorado, Utah, Washington and more. Best of all...Powder Alliance benefits are FREE! There are no membership fees, no collective pass prices, no additional charges of any kind. Guests simply show an anytime 2013/14 season pass from any participating Powder Alliance area and receive free skiing benefits up and down the West coast. So, go explore 3,000 acres at Snowbasin Resort, UT, dive deep into 480 inches of fresh snow annually at Stevens Pass, or ski into May at Timberline in Oregon. These benefits are FREE to full, anytime season pass holders at participating Powder Alliance resorts. To begin planning your winter road trip, visit www.powderalliance.com for details on participating resorts, special offers, and answers to frequently asked questions. Guests can also see who has the snow by following the Powder Alliance at https://www.facebook.com/powderalliance and https://twitter.com/powderalliance This is your season to explore. Get out there with help from the Powder Alliance. Sierra-at-Tahoe is located just 10 miles West of South Lake Tahoe and boasts 480 inches of annual snowfall, 2,000 skiable acres including 320 acres of heart-pounding backcountry terrain out the Huckleberry Gates. With a continued commitment to terrain parks, it is easy to see why TransWorld Snowboarding readers continue to name Sierra Top 10 Parks in the nation. More info at www.SierraAtTahoe.com.